Two longtime Iowa journalists were honored by the Iowa Center for Public Affairs Journalism-IowaWatch Thursday, Oct. 2, with Free Press Champion Awards for promoting and showing by example the benefits of transparent government in Iowa. Brian Cooper, editor of The Telegraph Herald in Dubuque, and First Amendment advocate Michael Gartner, owner of the Iowa Cubs Pacific Coast League baseball team were given the awards in front of 80 attendees at the nonprofit journalism center’s annual Celebrating a Free Press and Open Government Banquet at the Des Moines Downtown Marriott Hotel. 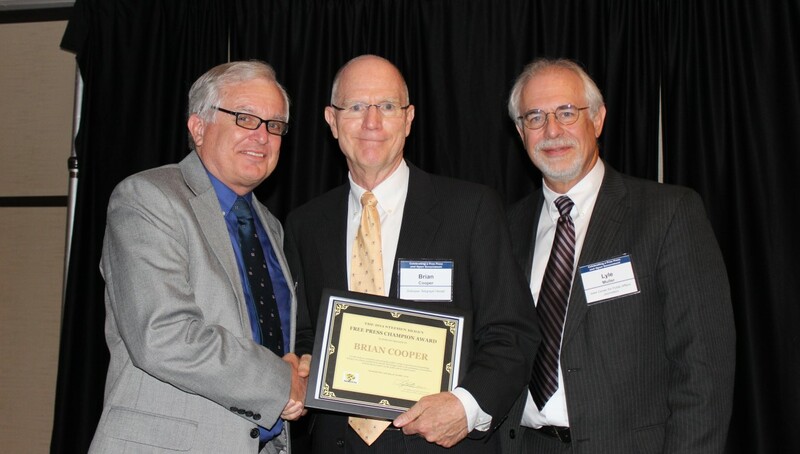 Telegraph Herald executive editor Brian Cooper receives IowaWatch’s Stephen Berry Free Press Champion Award at the annual Celebrating a Free Press and Open Government Banquet, in Des Moines on Oct. 2, 2014, With Cooper are (left) IowaWatch cofounder Stephen Berry and (right) IowaWatch executive director-Editor Lyle Muller. Brian Cooper received the Stephen Berry Free Press Champion Award, given to a working journalist who has ensured the public’s right to know is met. He has been The Telegraph Herald’s executive editor since 1986. He also has served on several committees and boards that exist to protect the First Amendment, including the Iowa Newspaper Association’s Government Relations Committee, the Iowa Freedom of Information Council Board of Directors, and as the Expanded Media Coordinator in Allamakee, Clayton, Delaware and Dubuque counties. Cooper has received the Iowa Newspaper Association’s Distinguished Service and Master Editor-Publisher awards and is the author of “First Heisman”, a biography of the first man to win the Heisman Trophy, Dubuque native Jay Berwanger. 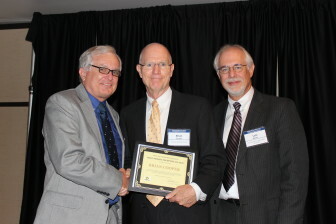 Michael Gartner (center) receives the 2014 Bill Monroe Free Press Champion Award at the annual IowaWatch Celebrating a Free Press and Open Government Banquet. Pictured with Gartner are (left) Bill Monroe and (right) Muller. Michael Gartner received the Bill Monroe Free Press Champion Award given to an Iowan who has promoted the public’s right to know outside of the journalism profession. The award is interesting because Gartner has had an illustrious career as a journalist at places like The Des Moines Register, NBC News, and Ames Tribune, where he won a Pulitzer Prize for Editorial Writing. A former fellow at the Institute of Politics at Harvard University’s John F. Kennedy School of Government, Gartner has served on the board of advisers at the First Amendment Center of the Freedom Forum at Vanderbilt University and of the Freedom Forum’s Newseum. He writes frequently about First Amendment issues. As a private citizen, he successfully sued the Iowa Public Radio Board of Directors for open-meetings violations, gaining a settlement in which the board agreed to broadcast announcements regarding government transparency and how to report violations. 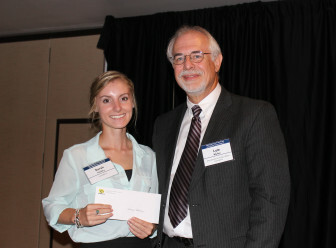 IowaWatch reporter Sarah Hadley receives the 2014 IowaWatch/Fotini Perlmutter Undergraduate Student Award on Oct. 2, 2014. The Iowa Center for Public Affairs Journalism also awarded its annual IowaWatch/Fotini Perlmutter Award for an outstanding IowaWatch student journalist from the University of Iowa School of Journalism and Mass Communication to Sarah Hadley. Hadley, a senior from Cedar Rapids, is an assistant editor who joined IowaWatch during her sophomore year. She also won this award last year. 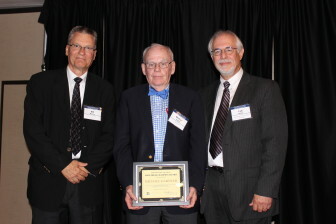 The Iowa Freedom of Information Council, the event’s title sponsor and co-host along with the Iowa Newspaper Foundation, presented its annual Harrison “Skip” Weber Friend of the First Amendment Award posthumously to longtime Des Moines Register senior news director Randy Brubaker. Brubaker died unexpectedly in May at the age of 55. Members of his family and the family of his late wife, Jan, accepted the award on his behalf. The banquet’s guest speaker was Jim Bohannon, the nationally syndicated radio talk show host whose programs, “The Jim Bohannon Show” and “America in the Morning”, are heard on more than 300 radio stations. Additional banquet sponsors were the Associated Press, the Iowa Broadcasters Association and the Faegre Baker Daniels law firm of Des Moines. 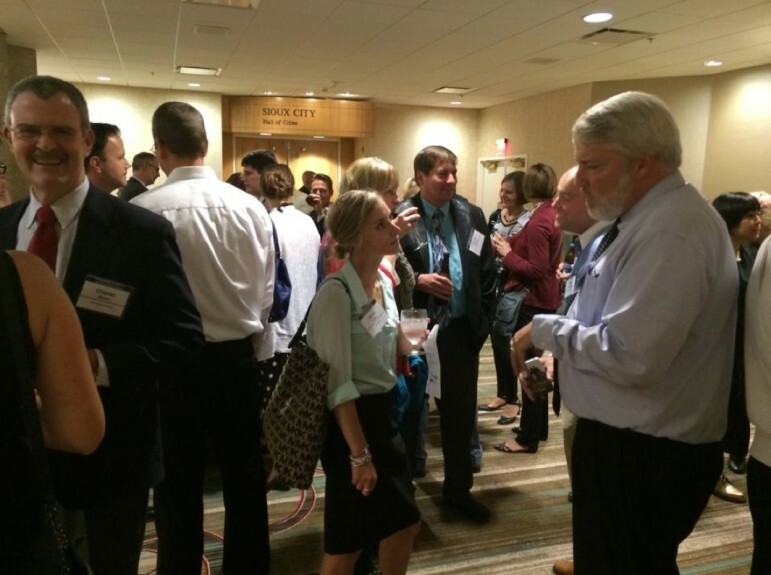 IowaWatch assistant editor Sarah Hadley (center) and Des Moines Register investigative reporter Clark Kauffman (right) in conversation at the annual Celebrating a Free Press and Open Government Banquet in Des Moines the night of Thursday, Oct. 2, 2014. To the left, in a different conversation is Charles Munro, a University of Iowa journalism and mass communication instructor and IowaWatch professional adviser.